Sometimes you might want to just have text on your dashboard that you can update at any time (like right before a meeting). 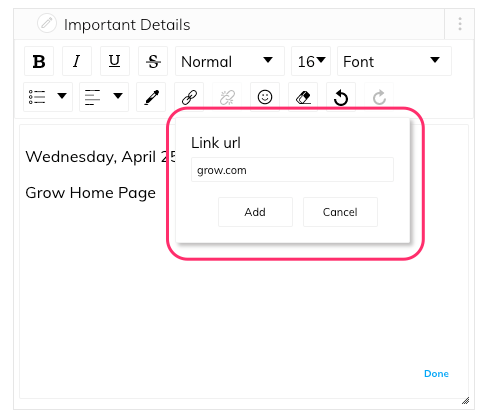 Grow lets you add a dashboard note to your dashboard to write out any important details you may need to jot down. To edit a dashboard, you must have the ‘Manage Dashboards’ permission. If you believe you need this functionality but don’t have it, talk with an admin on your organization’s account. To add a dashboard note, click on the Dashboard Actions button on your dashboard, then select Add Note from the menu. And that’s it! Your dashboard note can move and expand/contract similar to a regular metric tile. To edit your note, you can simply click within the box of text. Additionally, you can use the three-dot metric menu and click Edit Note. To change the title of your note, first go to the edit view for your note. In the upper left-hand corner, you’ll see a pencil icon. If you click this, it will highlight the title of the note. Go ahead and enter in your title. When you edit your note, you have a fairly extensive toolbar to let you format your text. If you want to add a link to your note, first type in the text for your link, then highlight it. Click the link icon in the formatting toolbar. This will cause a window to pull up where you can enter the link for your text. Once you have entered your link, press the Add button. When clicked, links in dashboard notes will open in a new tab. Whenever you are finished entering the text for your note, be sure to click Done in the lower right-hand corner.